Posted on August 29, 2016 . by Patrick Johnstone. Leave a comment. A few years back when I was still complaining about the City’s lack of action on a Tree Bylaw, I pointed out the presence of a great beech trees on my street. This was one of three, gigantic, more than 100 years old, trunks more than a metre across. They provide so many benefits to the neighbourhood and the community: shade, noise abatement, wildlife habitat, storm water detention, cooling the air. These three had “heritage” protection, so they were unlikely to be capriciously removed, but that limited protection was not afforded to most trees in the City. The vast majority were afforded almost no protection – if the landowner chose to remove them, she was good to go. 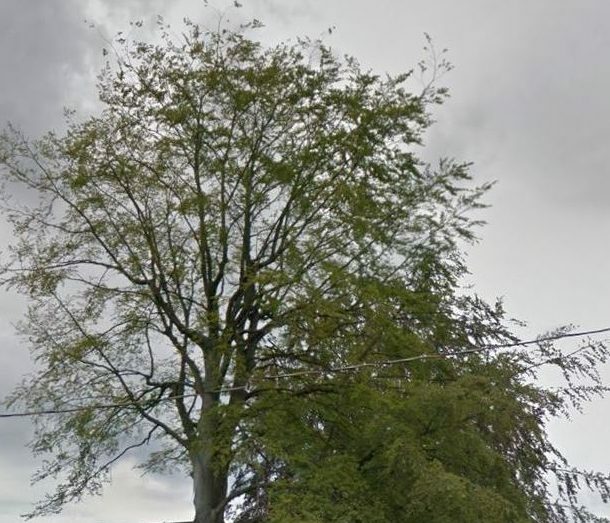 A Bylaw was needed, and through the lengthy development of an Urban Forest Management Strategy, these newly-monikered “specimen trees” are protected from removal by short-term thinking. Alas, I wandered over to the property in question, and indeed one of the three is no more. No more than pile of alarmingly large slices of wood, as the arbourists were working on site clean-up. I noticed a Tree Removal Permit attached to the house, so clearly they got permission, but I felt the loss as much as my concerned neighbour. So I called up staff and we have had some discussions about this tree. The story of this tree is that it was suffering from senescence, which is the technical way of saying it was dying of old age. I don’t want to get into the detailed description given by the arbourist, partly because I’m not an arbourist and may not clearly translate their terminology, and partly because there are probably FOIPPA issues in releasing a report provided to the City without passing it through the privacy protection filter. Our efforts to look back are, fortunately, assisted by technology. Google Street View has photos both from 2011 and from 2016 on adjacent streets. The visible decline of the tree is obvious. It looked (again, to my untrained eye) healthy in 2011, but by 2016, the leaves are sparse and diminutive, many branches looking bare. There was quite a bit more evidence of decline in the arborist report, but there is no doubt this tree was not very happy. The contributing factors to a tree like this entering full-plant senescence are usually multiple. Sometimes there is an attack by a pest, and the drought-like conditions we have experienced for a couple of summers probably hurt the resiliency of the tree. It is possible (I’m just speculating here) that poor pruning practice or damage to the roots for home improvements may have also been a factor, further reducing the ability of the tree to cope with declining productivity. In the end, the things that made the tree so majestic – its great size and hulking branches – are the things that made it a “hazardous tree” once that decline began. The arbourist did not think this was a temporary setback, and that recovery was unlikely. what was more likely was continued decline until the branches started to collapse, potentially onto a building or person. The homeowner got a permit, had a tree health assessment done, and received permission to cut the tree down. 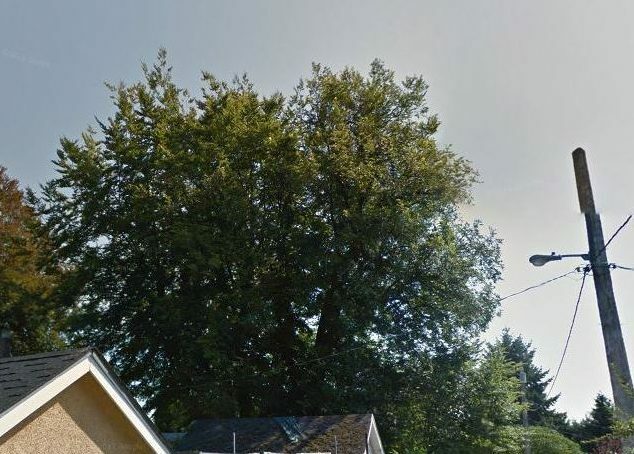 As this is a “specimen” size tree, and a hazardous one, Schedule A of the Bylaw indicates that the homeowner is required to replace the tree, and the City collects security to assure that replacement takes place. Of course, putting a new dogwood or birch sapling in the place does not really “replace” a 100+ year old giant like what was lost. It will be decades until the replacement starts to provide the mass of benefits that the old tree did. But even this replacement policy did not exist before the Bylaw. Which bring me to the point – the Tree Protection Bylaw does not mean no trees will ever be removed again. What it means is that the City has applied measures (call it Red Tape if you are so inclined) to act as disincentives to the removal of trees, and to provide compensation to the community for trees lost. When it comes to private property, that is about as far as we can go as a City. It has proven to work in other jurisdictions, though. The Bylaw is only one part of our Urban Forest Management Strategy, but it is an important part, and this fall Council will be taking a closer look at the Bylaw application to see where it can be strengthened, and where it needs to be relaxed to make it more functional for residents. If you have opinions one way or another, please send Mayor and Council an e-mail or letter. Posted on August 16, 2016 . by Patrick Johnstone. 5 Comments. 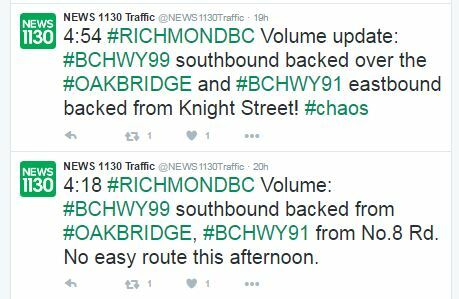 The Ides of August was hellish for people trying to get home from work. 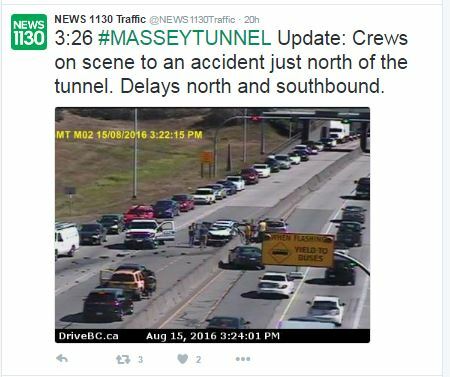 It was a hot day by Vancouver standards, without much of a breeze, but the sweat on the brows was more caused by a series of incidents where cars unsuccessfully tried to share space with one another. However, on a hot day like this, one incident causing delay often cascades into a series of other incidents as people become less patient, less rational, and the natural dehumanizing effects of being in a car get people treating everyone around them, the people they share a community with, like their mortal enemies for having the gall of trying to do the same thing they themselves are doing because aaaAAAARRGGH! I commute by car, by transit, and by bike, depending on day, weather, schedule, and lifestyle factors. Yesterday, I was fortunate to have taken my bike into work, so my commute home was relatively stress free. I have to admit a bit of smugness enters the mind when you are relaxed on a bike, enjoying the weather, and pedaling softly by a long line of single-occupant cars, which almost offsets the self-hatred I suffer every time I am in the car, stuck in a line, and see some much happier person riding their bike past me. However, having been that person stuck in a car, stuck in traffic that I am also a part of, it never occurred to me to blame the person on the bike for my physical predicament, or my mental state. So yesterday, I am riding east along Westminster Highway near the Nature Park during this traffic chaos when I see something new to me. I am exposed to Richmond Drivers on a daily basis, but this was a little over the top. There was a line of about six or seven cars just rolling down the bike lane. It is almost as if the drivers had decided that two lanes were not enough, and had, en masse, decided this is a three lane road, passing the vehicles stuck to their left. At some point, a group of about 4 were stopped at a light, and I rolled past them. This might have been a little untoward, but after all, it is a bike lane – no sharrows or bus stop or shared parking space or right turn lane ambiguity here, and I was on a bicycle. This was too much for a guy in a 4th generation Camaro Convertible with the ginormous Polska Pride flag decal covering the the hood. He took the opportunity to suggest to me in no uncertain terms, that I should not be riding my bicycle “on the road”. I saw this as a great time to remind him that I was, in fact in a bike lane, as evidenced by the nearby signage, and that he, in fact was also in the bike lane, without a bike, so I may have been in the right here. At this point, he started into a lengthy screed, which was about 40% profanity and about 60% Bruce Allen “reality check”, neither of which were probably appropriate for the 8 year old in the passenger seat to witness. The short version was that bicycle riders don’t buy insurance, they should not be on the road, and that I, although obviously homosexual, engage in unwholesome acts with my mother. I rode away from him and his impotent rage, and generally enjoyed the rest of my ride home. I did so, however, once again wondering what it is about driving a car that dehumanizes us. Why do we behave in a line of cars like we never would in a line at a bank? Why do we feel a car allows us the threaten and intimidate other people, be they children or senior citizens, and yell racial and homohpbic epithets that we would never do at a public park, on the beach, at work or in a mall? Outside of actual war, is there any other group activity we volunteer to engage in where we so publicly and unabashedly hate the people we are surrounded by? Why do we even do it? Also, what is this strange fascination with attempting to license bicycles like they are some sort of parallel with cars? As His Snobbiness (slightly profanely) reminds us: you don’t need a commercial pilot’s license to operate a car. Bicycles present pretty nearly no risk whatsoever to drivers, passengers, or public property, except for some risk of scuffing the paint on their car, for which ICBC will make the person at fault pay. Even if I did buy insurance attendant to the risk I present to third parties (which would surely cost a few dollars a year relative to the risk I pose when I shuffle down the road at 100km/h in 2,000lbs of steel), do I think Mr. Polska Camaro is suddenly going to see me as a legitimate sharer of road space and afford me respect? Yet for some reason, otherwise seemingly rational public servants from Toronto to Vancouver suggest there is some problem with adults riding bicycles that licensing can somehow cure. They aren’t too sure what the problem is, and have a hard time tying this solution to it, but they need to be seen to be doing something about the bicycles, because people in bicycles are not angry enough. Let’s all try to get along, folks. Autumn is nearly here. Posted on August 16, 2016 August 15, 2016 . by Patrick Johnstone. 2 Comments. Why is it believed that Pangaea is the only original continent? I understand that earth was essentially hit with “space water” which created our current ecosystem in that we can survive . Why though , was there only one super continent and not many different smaller continents ? Were there smaller continents that have been pushed below the “great blue” or do we not really truly know and it is all a wonderful hypothesis ? A geology question! Sorry I took so long answering it. Indeed, I was a geologist of sorts at one point in my life. I even got paid for a few jobs with “geologist” in the job title, but telling rock stories is now more of a pastime. That doesn’t stop me from spending an inordinate amount of time taking pictures of my own finger pointing out interesting things in rock – like the Ophiomorpha above. But you asked about Pangaea. Pangaea is the name geologists give to a “supercontinent” that existed about 175-300 million years ago. It is generally thought that during the early Mesozoic, pretty much all of the extant continental crust was pushed together into a single big piece, and (consequently) the rest of the planet was covered by a single huge ocean, Panthalassa. However, it likely wasn’t the only “supercontinent”, just the only one at the time. 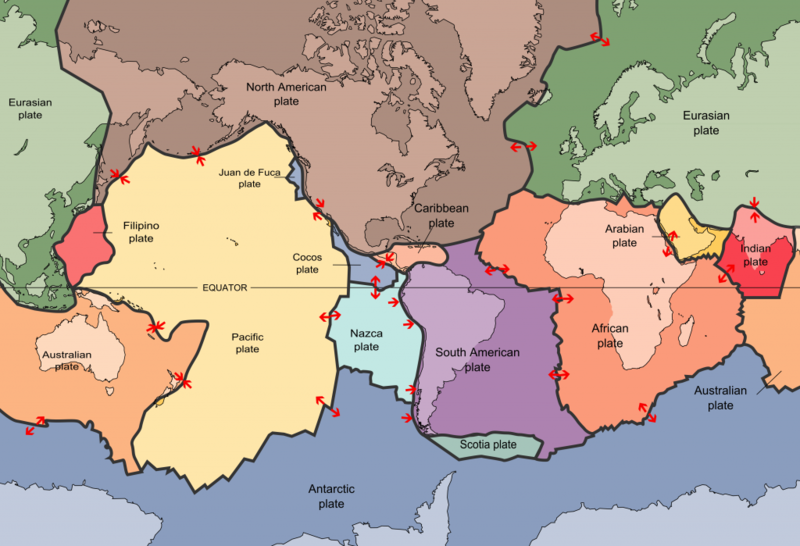 To understand the history, you need to understand a bit of Plate Tectonics. The crust is made up of two main types: continental crust (which is older, thicker, and less dense, for chemistry reasons we don’t need to get into here) and oceanic crust (which is generally younger, thinner, and more dense). There is some mixing of the two types, and most plates are an amalgam of both types, due to all that along-the-edge action. Most of the time, continental crust is distributed about the globe, rather like it is today, but sometimes it all bunches up in big amalgams, known as supercontinents. I’m not really sure we know why, or how often this happens, but Plate Tectonics has only been the prevailing theory of the earth for about 50 years, so people much smarter than me are still working our some of the details! Pangaea was the last time that we think all major pieces of continental crust were pushed together into more or less a single piece. They started to be assembled together around 300 Million years ago, and were pretty much broken up by about 175 Million years ago. I’m not sure if the dinosaurs even noticed, but the fact that early dinosaurs managed to populate what are all now spread-apart continents is one of the pieces of evidence that supports the theory. Remember, though, the Earth is much older than that. We have dated hunks of continental crust to almost 4,000 Million years, and have evidence that something similar to plate tectonics has been occurring on earth for at least 3,500 Million years. Because all of the collisions and other action at the edges tend to mess up the record, the further back we go, the less certain we are. This is made even more complicated because the plants and animals that make up the compelling fossil evidence for Pangaea’s geography simply didn’t exist before ~600 Million years ago. That said, convincing reconstructions based on multiple lines of evidence have been developed of the supercontinent “Rodina” from 1,200-750 Million years ago, and “Protopangaea” at something like 2,500 Million years ago. There may have been three or four more. So Pangaea is the latest, but not the only. The part of your question that doesn’t really fit the model of the Earth as a geologist would describe it is the inference that continents are “pushed below” the sea. For the most part, that doesn’t happen. When plates with continental crust collide, they get smushed together and create mountain ranges, like the Himalaya or the Alps. As they rise, they get eroded, and large rivers carry them off, one sand grind at a time, to the ocean, but that isn’t really the same thing as sinking. If a piece of continental crust collides with oceanic crust, you also get mountain building, and a bunch of volcanoes (think the west coast of Washington and Oregon), and you also get a subduction zone where oceanic crust gets pushed down into the mantle and melted. However, in those collisions, the less dense continental crust always stays on top. Very, very little of it is recycled back into the mantle. Now onto the water. There are only two reasonable hypotheses for why earth has so much water: it was here all along, or it came later as the Earth was pounded by water-rich comets and asteroids at the end of the Late Heavy Bombardment (Maybe 3,600 Million years ago). Both are probably true, but more recent hydrogen isotope data suggests that most of our oceans’ water was here all along. This is because our water is isotopically similar to the trace amounts we find in other nearby bodies (Mars, Venus, the Moon) and less like that we find in comets that we have recently been able to measure, like Hale-Bopp and Churyumov–Gerasimenko (which the ESA landed a freaking probe on last year!). That we have water in such abundance, and in all three phases, is a pretty fortunate situation for those of us who want to live a carbon-based life on this planet. This is either a much-too-convenient coincidence, or a banal observation, depending on your philosophical bent, but that has little to do with geology. Posted on August 10, 2016 August 10, 2016 . by Patrick Johnstone. Leave a comment. We had a short “Special” council meeting this week. This is a meeting that isn’t on the regular schedule, but we had a few time-sensitive items that came up, and a meeting was convened. Almost all commercial-zoned properties in the city permit pharmacies. There are a couple of established commercial properties in Sapperton near RCH that do not, because of historic inconsistencies in how the area was developed. It so happens an existing and successful pharmacy in the area wants to move to a larger property which is one of those few not zoned to permit it. A logical approach is to do a “housekeeping” amendment, updating the language of the two zones in Sapperton that do not permit pharmacies. That is, effectively, a rezoning, requiring a Public Hearing. Council approved this moving to the Public Hearing stage. This property near Canada Games Pool had an unprotected heritage house on it, and the owner decided to protect the house with a Heritage Revitalization Agreement in exchange for subdivision, which would allow more density and the building of a second house. Unfortunately, the conditions for protecting the heritage values of the original house were breached, meaning the terms of the HRA were not met. Therefore, the City has come to an agreement with the owner to reconsolidate the lots, effectively taking away the benefits the owner received through the HRA. The new agreement will not need a Public Hearing, but there is an Opportunity to be Heard on the issue scheduled for the next Council Meeting on August 29. C’mon out and tell us what you think. As discussed above, this Bylaw to allow pharmacies in two commercial zoning designations in Sapperton was given first and second reading. 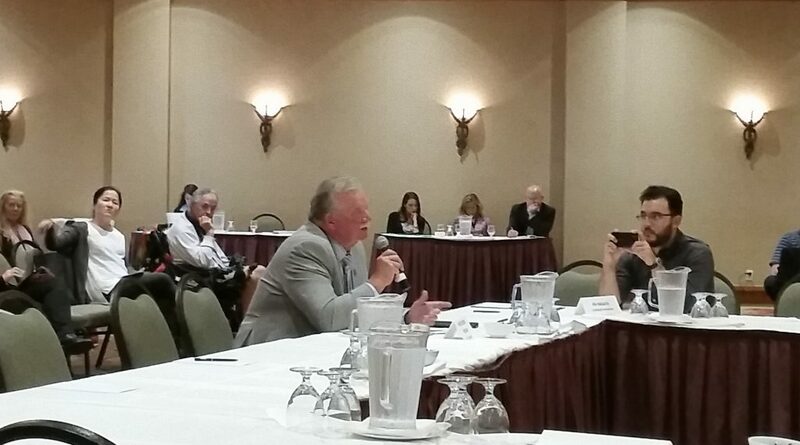 There will be a Public Hearing on August 29, 2016. C’mon out and tell us what you think. And with that, our special early august meeting was adjourned. Enjoy Pride everyone!